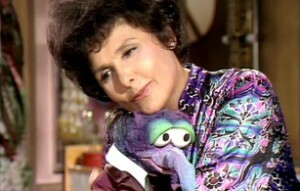 Growing up, my only real point of reference for Lena Horne was that she was a celebrity who appeared on Sesame Street, but in her relatively brief scenes, she exuded a warm, gentle glow that, even at a young age, made me sense that she was one of those people who really got the Muppets. She and they seemed to fit together so naturally that I remember her spots on the show more vividly than most other famous people who popped up there. By comparison, her Muppet Show episode doesn’t feel nearly as iconic, and that’s almost entirely due to the writing and presentation. The show still hasn’t fully figured out how to best feature and utilize its guest stars consistently. There are some terrific moments that demonstrate just why she was such a beloved performer, as well as such a wonderful friend to the Muppets (she, in fact, believed in them so much that she agreed to do the show, even though she rarely did TV and her people advised against it early on, assuming it would flop), but they seem to happen–more often that not–practically in spite of the episode and its overall creative decisions. The strangest example of this is in her otherwise beautiful first number, “I Got a Name,” a lovely, gentle, and passionate song that she performs on a train station set, Muppy sitting by her, his head in her lap, and a chorus behind her made up of Fozzie, Gonzo, and numerous Season-1-only Muppets: Hilda, George, Mildred, and the Guru. But what could have been a classic Muppet moment is marred by the fact that Horne never makes eye contact with any of the Muppets during the song other than maybe a quick glance down at Muppy. She can’t. Again, they’re all standing behind her, and the staging never has her turn around. I can’t for the life of me imagine who thought this was a good idea. Isn’t interacting with the Muppets the whole point of being on The Muppet Show?! She also has a cute little scene in which Fozzie interrupts Kermit’s Talk Spot with her, because he’s tired of Kermit getting to hog all the time with the celebrity guests, but then, in the course of talking to Horne, reveals that he doesn’t know what Lena Horne looks like. He claims to be a huge fan of Horne’s but then is surprised to learn from Kermit she’s on this week! In other words, he doesn’t know who he’s talking to. “This week?! Wow, I don’t want to miss that. Are you gonna stick around and see her?” he asks Horne. She responds, “I might just do that,” and then when he asks her name, she claims that it’s Doris Day. “Cute. Cute name,” he replies, clearly never having heard that one, either! Horne is having the time of her life here, not only being a good sport but also being truly delighted by the Muppety madness around her. And yet, overall, the episode just doesn’t seem to utilize her well. As previously mentioned, one number, which could have been great, is effectively wasted on managing to isolate her on a stage full of Muppets. Her next appearance, on a Muppet Newsflash, is wasted by just not being very funny or clever. She plays a woman on a seaweed-only diet who “twice a day…find[s] myself going in and out with the tide.” And then her remaining scenes, while nice, are all completely unrelated to each other. 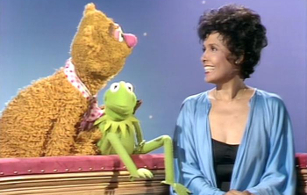 While the backstage plot is at least about Lena Horne–in that it’s about the fact that Kermit cuts Piggy’s number from that week’s show so as not to embarrass her when she goes on to sing after the great Horne, but then allows Piggy to believe that it’s the other way around, to spare her feelings, until Scooter accidentally reveals the truth, causing a classic Piggy meltdown/karate-chop extravaganza–she doesn’t directly take part in it, unless you count the curtain call, in which she tells Kermit that she heard Piggy rehearsing backstage and thinks she has a lovely voice. It seems like a huge missed opportunity to not have had a Piggy/Lena confrontation. It could have been terrific to see someone with such a gentle persona get in a squabble with her, and to play more against type, as they did with Florence Henderson. And it seems particularly odd that, in the first episode in which they realized that they could do a backstage number, it didn’t occur to them to actually link that number to the rest of the “plot” in any way. Instead, it’s just yet another sketch in a series of sketches, which, as I’ve said before, was the major reason that, in its first season, The Muppet Show was, surprisingly, a fairly traditional ’70s variety show, at least in overall format. And the sad thing is that means that even the most luminous of the first season guests often got short shrift.